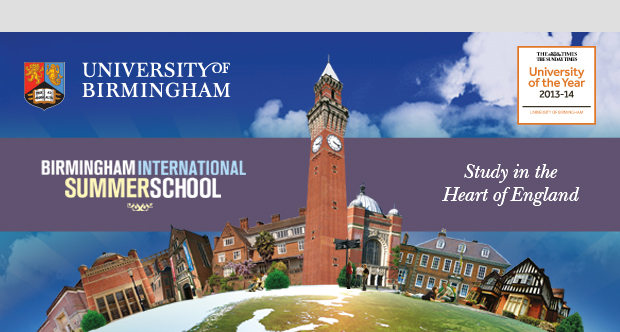 The University of Birmingham is pleased to announce that applications have opened for the International Summer! School. It is an exciting and excellent opportunity for international students to study in England on one of the most beautiful campuses in the UK and to experience British Culture. There are three different programmes on offer in 2015, including Cultural Heritage, Mathematical Finance and Financial Time Series, and Sport and Health. Students will also have the opportunity to gain a valuable insight into the fascinating culture and heritage of Britain through an extensive social programme. Fees: The fee for the 3 week program is £2,500. UNSW students qualify for the Universitas 21 partner institutions discount of £150. Scholarships: There are £250 scholarships for Birmingham International Summer School students registered for full-time programmes at UNSW. If you are made an offer for the Summer School you will be given further information on this scholarship. How to Apply: Applications for BISS are now open and can be submitted online by the deadline of 31 May 2015. If students have any questions about the BISS, please do not hesitate to contact the University at biss@contacts.bham.ac.uk.